Now I am going to show you How to open your Folder by Entering a Password. That means you can protect your data in particular folder. Whenever you want to open this Folder then you have to Enter your password because I will use “Attrib” command of DOS for hide Folder and then I will Open it by password. So here is VB Script code to Open that Folder by password. Let’s Start. 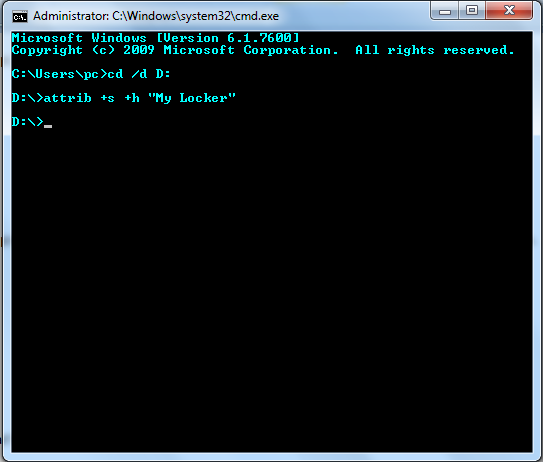 Step 4 : Now Open your Command Prompt and type the following command one by one. Now You Folder "My Locker" is Hidden when you want to open that folder you have to double click on “Locker.vbs” and then you have to provide password to open it. Default Passwprd is “errorcode401”. To change it Right Click on Locker.vbs then Click on EDIT then Find for “errocode401” and Replace it with your password.